"Most of the U.S. population has been living for years on the knife-edge precipice between solvency and ruin." Written by Robert Kiyosaki, the author of Rich Dad, Poor Dad, The Business of the 21st Century is a look at what wealth is, how it affects your future, and a method for how to achieve it. 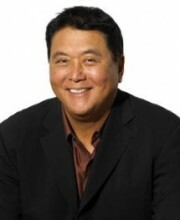 Kiyosaki, with his wife Kim Kiyosaki, and business associate John Fleming, provide information on how business has changed significantly in recent times. The days of a single career for life, ending in a comfortable retirement are largely gone. A lifetime of work across several different jobs will leave many people with a retirement of poverty. Kiyosaki et al then go on to talk about a way to succeed financially despite all the challenges of the current business environment. They discuss how the business model works and how to succeed at it, including different options for how to enter, and how to succeed. "Working hard at making money will never create wealth." Earning a regular wage will get the average person by from day to day, week to week, but will not continue to pay after wage-earning work stops. Wages only come as long as you work. The same is true when you work for yourself. The minute checks stop coming from clients, the self-employed person stops earning. Only when you get your money working for you do you cease having to work for wages every day. Of course you need money in the first place in order for it to be able to work for you. This is the catch 22 that most people face. They have skills to work and earn enough money to survive; what they don’t have is enough earning potential to provide sufficient excess money that can be invested and start working for you. In the first gem of this book, we will look at Kiyosaki’s model for four earning quadrants. In order to get your money working for you effectively, you need to own a large business or have large investments, primarily in real estate. Now, unless you have enough money to invest in real estate, it’s not a good starting option. That leaves owning a large business, where large is defined as having approx. 500+ people working for you. Some people, with the right idea or product, manage to build, through hard work and good luck, a big business—which eventually allows them to start investing money coming out of the business in ways that the money begins to earn more money. Unfortunately, for every business that succeeds from the ground up, there are many that fail. The failures can come from bad timing, bad luck, too small a market share for the offering, or many other reasons. The bottom line is that it’s tough to succeed at building a large business from the ground up. So far, the odds of success sound long. There is an alternative that the book provides which allows anyone to start a large business with little investment, no great product or idea, and do it in an environment where everyone has a vested interest in your success. The authors are referring to Network Marketing. There is an important difference to their approach to Network Marketing then you’ve probably heard in the past. Many people believe that they need to be constantly be selling the product offerings of the Network Marketing company headquarters. In truth, what you need to spend most of your time doing is selling others on the idea of signing up under you, so they can grow businesses that will pay dividends to you. Grow your own network as wide and deep as you can. Teach your downstream how to sell the products and the network. Help them build as wide and deep as they can. Ensure orders are processed in a timely manner, and cash flows back as quickly. That, in a nutshell, is how to build a big business from nothing in the 21st century. "But even more important than the quantity of money you make is the quality of the money you make. In other words it isn’t just how much you make, but how you make it, where it comes from." 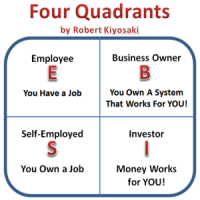 Robert Kiyosaki has, in previous books, resented this quadrant diagram for how wealth is earned. He is quick to point out that you do not want to be in the left half if you want to build sufficient wealth to become independent. Earning a wage from a company only earns you money when you actually work. The same is true of the self-employed. Only when you are running a large business or managing large investments do you have money earned for you by others. Only in the right-hand quadrants do you have freedom to control your life without concern for the next paycheque. "As a network marketer, you might think your job is to demonstrate and sell a product. It’s not. Your job is to communicate information, to tell a great story, and build a network." If you choose to pursue a Network Marketing opportunity, who you know, and who they know, will become important to you. You will need to sell the opportunity to many people in order to build a successful business. While it is possible to connect to strangers and have them become successful parts of your business, it is more work to connect to them than to connect to people you already know – your network of contacts. You need to know people to make this succeed. Not everyone in your network needs to be a close friend, but you have to comfortable approaching them with a business proposition and they have to be willing to give your proposition a fair listen. The wider and well-tended your network, the easier it is to find enough people you can bring into your company and set everyone up for success. This book provides a provocative look at a totally different way of achieving wealth. A way that is working today for thousands of people, all of whom want you to join and succeed because this business model is not based on us or them; it is us and them, and then some more.